Our Not So Deficit Problem | This is Ashok. Ok a few very important caveats. The y-axis here is a very narrow range, so the dynamics aren’t nearly as significant as would first seem. 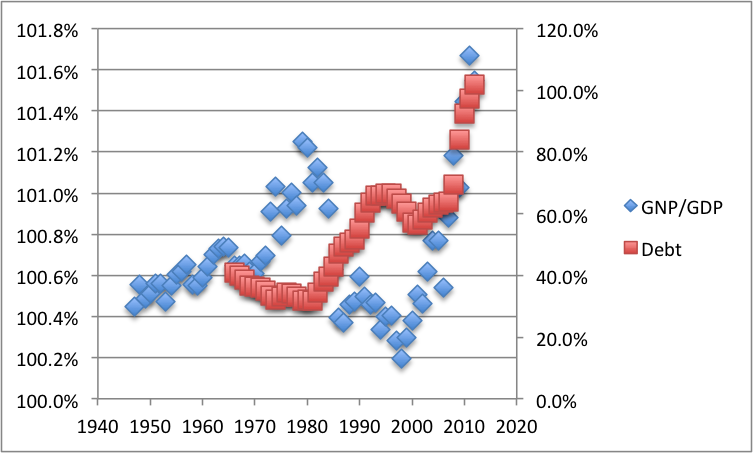 But there does seem to be a general trend: that is over the postwar period there was a consistent increase until the ’80s, after which there was a (relatively) sharp decline until 2000, after which GNP/GDP goes up again to its highest point ever. Similarly, if a country becomes increasingly in debt, and spends large amounts of income servicing this debt this will be reflected in a decreased GNI but not a decreased GDP. Similarly, if a country sells off its resources to entities outside their country this will also be reflected over time in decreased GNI, but not decreased GDP. This would make the use of GDP more attractive for politicians in countries with increasing national debt and decreasing assets. Or basically what conservatives have been preaching this whole time. After all, a Treasury is a claim on future American growth. James Hamilton frequently claims that interest rates are going to rise bringing rise to this truth. As the increase in the blue line since 2000 tells us, that last component has been going down well before Bernanke started QE. Brad DeLong talks about a shortage of safe-assets. He’s right. Bernanke has talked about a global savings glut. He’s right. Whatever the case, despite massively increased public debt, our national income has increased faster than domestic product. Contrary to everything the pols tell you, our claim on the expected future returns of everybody else is more than theirs is on ours, and it keeps growing. Here’s another secret: this means we can and should borrow a lot more money to invest. In fact, America could become something like an ultra bank for a while based only on international confidence in the Dollar. 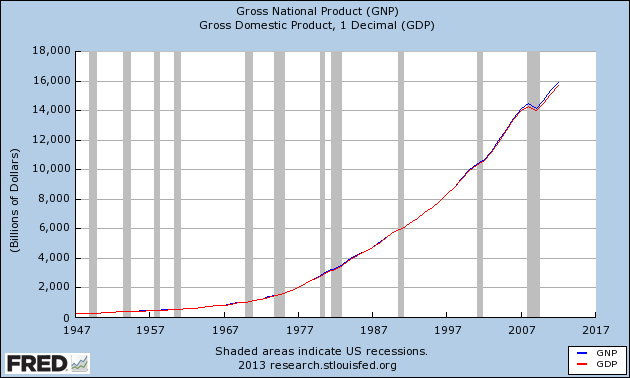 Of course, the public deficit isn’t the only component in the picture. Foreign companies obviously own American stock and corporate bonds. I hear rich Chinese people are buying land in New York City nowadays. But the point is the biggest fears vis-a-vis short term government debt are, for lack of a better term and irony, inflated. Wait, we run a trade deficit? America is the biggest and baddest hedge fund of them all. Look, based on that last point, there’s actually a bit of inbuilt short-term volatility here. Theoretically, we could sell our foreign assets and buy our own very safe debt. Our income comes from American capital equity abroad. Trade theory tells us we’re leveraging ourselves and, obviously (see: 2007), this isn’t always a good thing. But we have good reason to believe that much of the world is undergoing relatively strong (I mean in India 5% is bad) economic growth. I’m not saying they’re all in the same convergence club, but over the next 50 years global income is going to increase. Lots. And equity markets are pretty well correlated with GDP in the long-run. (They’re not nearly as much in the short-run, which is where the volatility comes from). This means as globalization progresses, we might see some short term flux in GNP/GDP, but in the long-run it’s a safe bet. None of this is defending bad spending (see: the American military). None of this is saying long run problems with regard to social security are no big deal. I am saying that if America was a company, I wouldn’t be all too worried about its finances. That it’s a government with sovereignty over the global reserve currency and oil purchases just makes me a million times more confident. Bill Clinton was President in 2000, not Bush. None of the 2001, nor 2003, tax cuts were random. Especially the marginal income tax rate cuts; they were heavily weighted toward benefiting the lower income Americans. The lowest incomes were cut by 100% in some cases to zero. Moderate income people saw a 1/3 cut from 15% down to 10%, and the top bracket was cut only about 12% from 39.6% to 35%. Bush’s Medicare bill was designed to take the place of an even more costly proposal by Democrats. Iraq wasn’t invaded until 2003. Right. 2001. Sorry. I get that 2001 and 2003 are the years specific actions were taken. Point is, the Bush presidency was a fiscal disaster throughout. He actually campaigned that budget surpluses were bad because the government might spend it, when he could have vetoed any increases in spending! No, all Bush’s Medicare did was allow American taxpayers to subsidize cheap medicine abroad (including other rich countries). You did manage to respond to everything. But the point of this post, of course, which is there is no crisis of American debt.